I noticed on your Harrison County famous Sons and Daughters page you have some well known celebrities and thought you might be interested in another Harrison County son who won a major golf tournament. My father, Sam Parks, Jr., is pictured on the left at age 26 holding the sterling silver trophy he won for the 1935 US Open, that was presented to him by the President of the USGA and Connecticut Senator, Prescott S. Bush. In 1909, Faye Watson Parks, returned to her parent's house (Wilber and Hanna Watson) in Hopedale, OH from nearby Pittsburg (it was spelled that way then) to have my father delivered by the family doctor. My father's interest in golf was piqued when his father joined Highland Golf Club in Pittsburgh in 1921. Dad took his first golf lesson in the spring of 1922 from the new club professional, Gene Sarazen. Sarazen's intense all day practice sessions in April and May were keenly observed by Dad and made a life long impression when Sarazen won the US Open in June. The 1904 Canadian Open Champion, Jack Oke became the club pro in the late 1920s and worked with my father in perfecting his game. At age 15, Dad won the Club Championship, and in his teens, won the Western Pennsylvania Amateur three times to retire the trophy. At Bellevue High School and at the University of Pittsburgh, Dad started the golf teams, and represented PITT at many collegiate golf events including the prestigious North - South Amateur and the National Intercollegiate (NCAA). In 1932, he turned professional and, a year later, he became the club pro at South Hills Country Club in Pittsburgh. From 1932 to 1937, Dad played in the winter tour tournaments from January to April that started in California and moved South East as the weather warmed. He played in the 1931, 32, and 34 Opens and in the first Masters at Augusta in 1934. 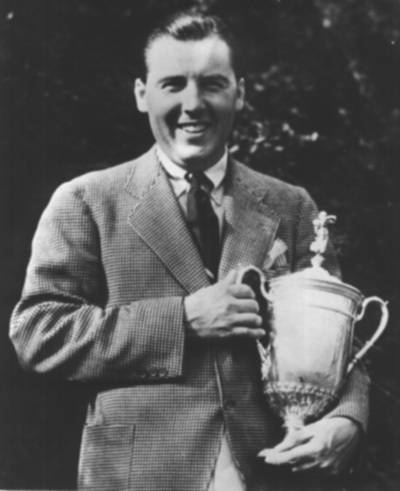 In the 1934 Pennsylvania Open at Oakmont Country Club (Pittsburgh), he finished second with 298, a score which would have won the 1927 Open at Oakmont. In preparation for the 1935 Open, Dad played nine holes almost every morning in May and June at Oakmont, returning to his club pro duties in the afternoon. He made notes of what club to play to hit the green from fairway landmarks. On the green, he would putt many balls from different locations and note the way the ball would curve on its way to imaginary hole placements on the undulating and extremely fast greens. After a first round 77, Dad said he was in about 17th place, a second round 73 put him about 4th, and a third round of 73 made him tied for the lead with Jimmy Thompson. His initial thought was that he could finish in the top 10 with his local knowledge, but after the third round, he thought he could finish in the top five. A final round 76 gave him the winning score of 299. Dad played on the 1935 Ryder Cup team against Alf Perry, the first time the US Open Champion would play the British Open Champion of the same year. At the 36th hole, Dad made a 30-foot putt birdie to win the hole and tie the match so that both players were undefeated in Ryder Cup play.Dad was a club pro until 1941 when he went to work for US Steel. He retired in 1971 as the Sales Manager of the Pittsburgh Region, to Largo, FL. In his career, Dad played in 18 Masters, 14 US Opens and 12 PGA tournaments. When asked about being an unknown when he won the Open, Dad would answer, "My name is still on the trophy." Dad knew all big names in golf and played many rounds of tournament and exhibition golf with all of them including: Ben Hogan, Walter Hagen, Arnold Palmer, Johnny Miller, Julius Boros, Bobby Locke, Sam Snead, Horton Smith, Babe Zaharias and Ky Laffoon to name a few. I was very fortunate to meet some of these golfers and be part of their wonderful conversations. In 1953, Dad took me into a room where Ben Hogan was relaxing after playing a practice round for the 1953 Open at Oakmont. Hogan was alone, and said, "Hi Sam" when we walked in. After a moment of pleasantries, Dad said, "I'd like you to meet my son Dave." Dad was a very humble man, very bright, had a fantastic memory and a real knack for telling fascinating stories about golf and golfers, and loved being part of its history. I am still researching the Parks family genealogy and any help from the Buckeye state would be greatly appreciated. 7. Sarah Parks (Wilson) was a high school principal in Astoria, Oregon. 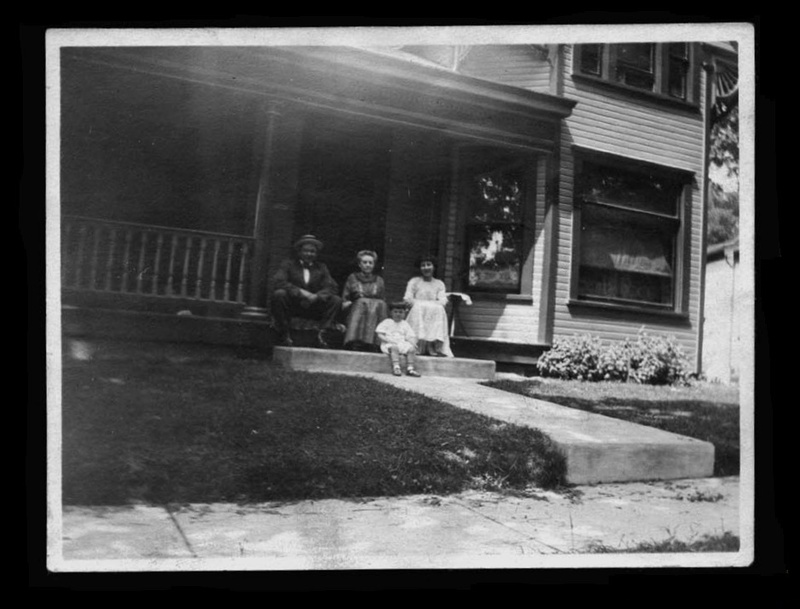 Below is a page from a photo album with a picture of Wilber and Hanna Watson's house taken about 1911 with Wilber, Hanna, my father about age two, and mother Faye Watson Parks sitting on the porch steps. Underneath the picture my father wrote "Hopedale Ohio. I was born in this house."